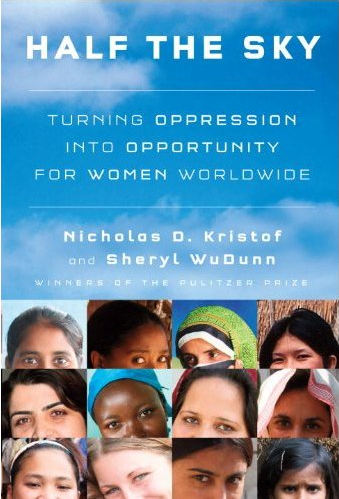 Everyone should read Half the Sky by Pulitzer Prize winning journalist Nicholas Kristof and Sheryl WuDunn. In 2009, Nicholas and Sheryl, New York Times correspondents, published this book. They have interviewed and documented stories about “the oppression of women and girls in the developing world.” It is one heart-wrenching story after another. The women they write about have extraordinary strength. Tonight on PBS at 9pm eastern they will air the documentary Half The Sky. If you are unable to watch the documentary this evening, please go to the PBS website listed above and watch the clips. You can also order the book and the dvd at amazon. To join the movement or learn more about it, please go to the website . It is inspiring what Nicholas and Sheryl have accomplished since they published Half The Sky and what they have done for women and girls. We all can make a difference and every gesture big or small counts. In the back of the book they list many ways one can get involved. When woman are empowered, everyone wins. I admire Zainab Salbi and her organization Woman for Woman. Thank you for introducing me to Woman for Woman. I have sponsored a sister for the past four years.By helping one woman at a time this organization has helped over 153,000 woman since 1993.